London Bridge Station, the fourth largest train station in the country with close to 50 million commuters passing through its doors each year, was a key transport link in one of London’s busiest years. 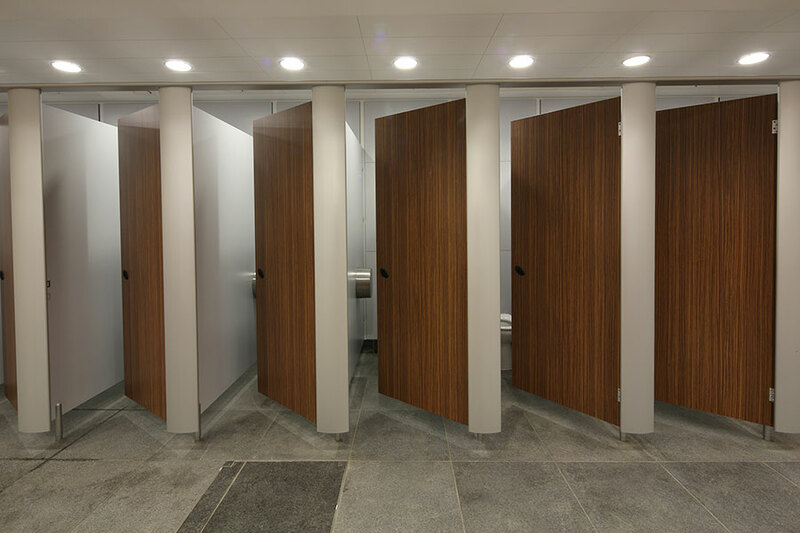 Concerto integrated duct panelling in solid grade laminate. The impressive Victorian station, based in the heart of the city, is one of the oldest in London and has recently been completely overhauled in a £10 million renovation project. The project, which was recently awarded the highest ever score under the CEEQUAL sustainability scheme, was driven by a need to accommodate the hundreds of new daily Thameslink trains and projected two thirds increase in passenger numbers. 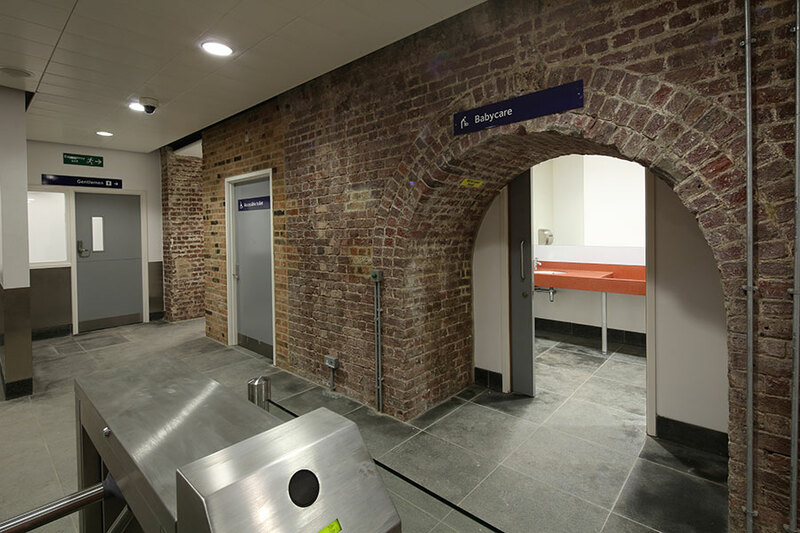 The new washroom facilities, installed beneath the station nestled under the brickwork of the old station arches, exposed as a design feature, highlight Washroom’s exceptional ability to create bespoke solutions perfectly suited to any space. The curved aerofoil aluminium pilasters and headrail that define the Mezzo range, perfectly complement the curved arches and original Victorian brickwork, bridging the link between old and new seamlessly. Washroom designed, manufactured and installed 23 Mezzo solid grade laminate cubicles, all with fully removable doors, to allow for access in case of injury and all within the space of five weeks from initial order to completion. Concerto solid laminate ducts on metal framework were installed in the male, female and disabled areas and on the vanity units to complement cubicle style and allow easy access for maintenance. Solid grade laminate, which provides a robust finish that will not chip or peel, was specified as it offers ultimate durability, even in high traffic areas, thereby reducing future maintenance costs. 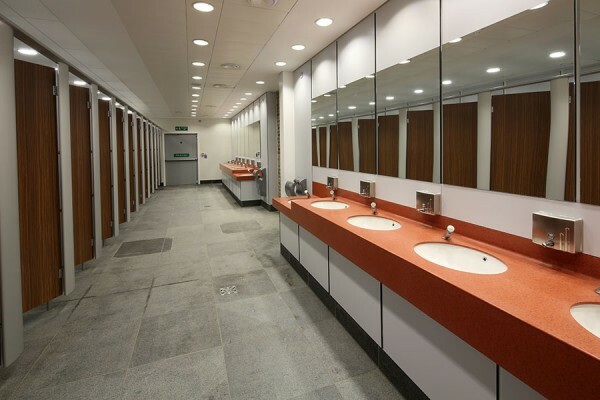 Gently shaped vanity units and baby change facilities were manufactured in Staron solid grade laminate on metal framework, which is both non-porous and stain resistant, ensures ease of cleaning and keeps maintenance to a minimum. 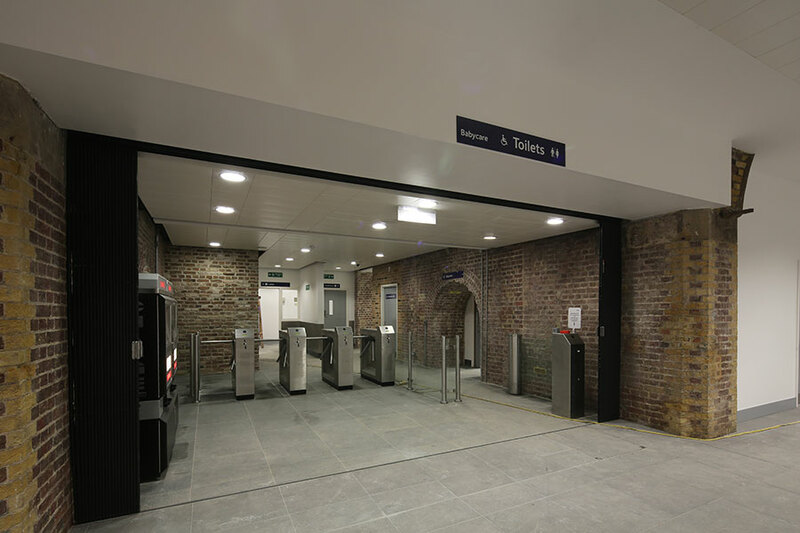 And, as well as being highly durable, Staron, which is available in a choice of over 80 colours, can be joined with no visible seams creating an integrated smooth finish, further enhancing the facility while ensuring a durable, long-lasting solution for this busy station. All materials used on the project were manufactured to special order, meeting Class O certification for rail use, surface spread of flame, and complying with Document M.